Mark Wahlberg has a tendency to be type cast as the guy "from the streets" and while he has often expressed some displeasure with the kind of films offered to him there is certainly no way you can deny how well he does in these roles. His newest venture is called The Fighter, about the early years of Irish Mickey Ward and his brother, Dicky, who helped him train before going pro. The movie stars Mark Wahlberg, Christian Bale, and Amy Adams. Bale plays Mickey's brother, who among other many character faults has a severe drug problem that is always a cause of concern for Mickey. Amy Adams plays Charlene Fleming, who becomes Mickey's girlfriend and helps him escape the destructive pull of not only his brother but his family as well. What we get in the movie is not only stunning performances from every single person involved. Christian Bale, at this point, has proven that he is one of the greatest method actors of movie history. Not only has he shed the bulky muscle of The Dark Knight and become an emaciated shadow of that physique, but he also perfectly brings to bear the emotion of a brother who loves his sibling but has many personal demons of his own that affect the relationships around him. What Mark Wahlberg does this time around besides playing another tough guy from the streets, is that he carries with him in every scene the weight and pressure of not only his brother's problems, but his own families as well. Mickey's family, especially his mother, is extremely over bearing and manipulative which being from a small town and lacking some self confidence, Mickey has no way of standing up to any of them. The other force Mickey has to contend with is the townspeople themselves. You see, a few years back Mickey's brother was the up and comer. Everyone was expecting him to carry them out of obscurity and into the public eye. Now that Mickey is attempting the same thing as Dicky there is added pressure on Mickey to succeed where his brother failed. Amy Adams over the years has bounced around from comedies to family fare to drama. With this movie, however, she proves that she can go toe to toe with heavy weight actors and not break a sweat. The word is that she has been nominated for a Golden Globe for her work in this movie and she certainly deserves it; her scenes with Mark's character as well as the actors who play Mickey's family show that she has the acting chops. The last thing that needs to be mentioned in regards to this film is the fight scenes. Back in the seventies when Rocky hit the theaters it portrayed similarly the rise of an unknown "bum" to become a legend. What stood out in the movie was not only the fantastic acting, but very realistic and well choreographed fight scenes. This movie draws on that and builds; apparently Wahlberg used the same film crew that shoots HBO's Boxing events for the fight scenes in this movie. The pay off is fights that look stunningly realistic, this is probably because the actors were really hitting each other during the filming. This movie comes out just in time for the Oscars and while it may not stand up to other contenders that are out there, there is no doubt that this movie will hit you like a solid right hook. Download The Fighter from the iTunes Store in Digial HD. 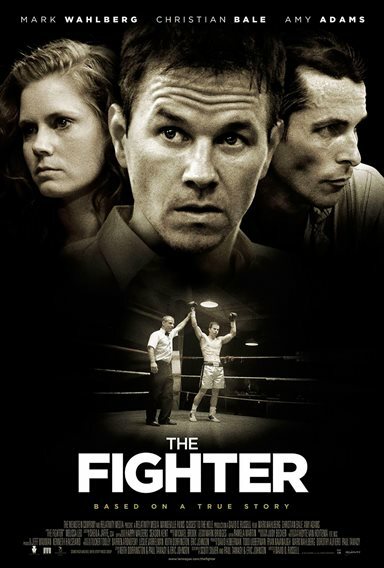 For more information about The Fighter visit the FlickDirect Movie Database.